Starting from Scratch: A Different Kind of Writer’s Manual, Rita Mae Brown, Bantam, 1988, ISBN 0-533-05246-2, 272pp. 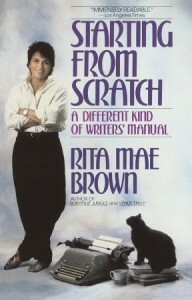 This is an excellent writer’s manual in many ways–I particularly enjoyed the emphasis on reading classics for “what works,” the reasoning behind why a writer should know Latin, among others–even while it is totally inappropriate in others–things such as the unrealistic expectations based on Brown’s own successes and her failure to understand genres, especially science fiction, fantasy and mystery. Still, the annotated reading list in the back is amazing for the simple fact that you have a hard time imagining that one person could read all of it, and yet it challenges you to give it a go. So I shall. This would be an excellent book to re-read in a few years.